Triumph was established in Coventry in 1885 as a bicycle manufacturing business. The company then went on to produce its first motorcycle in 1902 and a three-wheel car followed in 1903. It was another twenty years before the first Triumph 4-wheel car was produced in 1923 at the newly acquired factory in Clay Lane. From then on Triumph gained a good reputation for building high quality small to medium sized cars, and in 1936 the motorcycle part of the company was sold off. By the late 1930's despite great success in motor sport, Triumph were in financial difficulties and in 1939 went into receivership. In 1945 Triumph was purchased by the Standard Motor Company and in the hands of Sir Stanley Black, went on to achieve great success with the many fine cars being built at the Canley factory in Coventry. These cars included of course the first of the TR sports cars the TR2, which had its debut in 1952 at the London Motor Show. What was to become another evergreen for Triumph, the Herald, with its legendary 25 ft turning circle, was launched in 1959. Many more great cars were produced during the 1960's & 1970's but by then Triumph had become part of the British Leyland group and the last car to bear the Triumph name was the Honda designed Acclaim which was produced between 1981 & 1984. Well known today by many as the car driven by Bergerac in the 1980's BBC television detective series of the same name, the Triumph 1800 Roadster was introduced in 1946. The very attractive Triumph Herald was launched in April 1959 and was to have a very successful 12 year production run. The bodywork had been designed by the Italian stylist Michelotti and the modern looks hid very well the rather outdated means of construction. 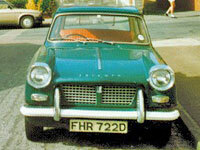 The Triumph Mayflower was introduced in 1949. Its distinctive razor edge styling was borrowed from the larger Renown saloon that had been introduced the same year. Following on from the earlier 1800 & 2000 saloons, the Triumph Renown was introduced in 1949 as a luxurious up-market saloon. Triumph had not failed to notice the success of the Austin Healey Sprite, and wanted a small sports car of their own to capture a share of this market. The result was the Triumph Spitfire introduced in 1962. The Triumph TR2 went on sale in 1953 and was the first in a long line of successful sports cars to be built by Triumph. Its chassis was based on the pre Second World War Standard Flying Nine, and featured bodywork styled by designer Walter Belgrove. The Triumph TR3 arrived in 1955 following on from the sucessful TR2. Very similar to its predecessor, the TR3 used virtually all the same running gear including the engine, although it had gained slightly more power. The Triumph TR4 was introduced in September 1961 to replace the TR3. It used a modified TR3A chassis and the 2138cc 4 cylinder engine that was previously available on the TR3A as an option. The Triumph Vitesse was launched in May 1962 in both saloon and convertible versions. It was based on the successful Triumph Herald that had been introduced in 1959 and shared many of it components including the chassis and very stylish Michelotti bodywork.